Eedris Abdulkareem join forces with konga on this brand new jam titled Trouble Dey Sleep. 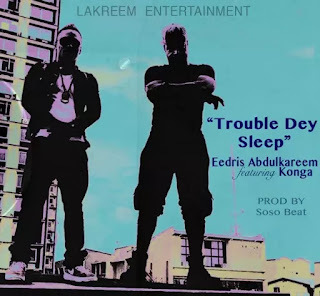 Legendary Hip Hop act, Eedris Abdulkareem has urged the Nigerian elite to be patriotic and lead by example in his latest single release titled “TROUBLE DEY SLEEP”. The single released in response to the Honourable Minister of Information, Lai Mohammed’s call on practitioners of the creative industry not to take their video production abroad. This calls on the political class, civil servants and people in authority to practice what they preach by patronizing Nigerian schools and hospitals as well as consumption of Nigerian made goods. Because that’s the only way the health and educational infrastructure could be developed. Throwing more light on the Inspiration behind “ TROUBLE DEY SLEEP “, Eedris Abdulkareem said “he was inspired by the challenge from the Minister of Information which he felt should not be a one way thing, because to make Nigeria great requires sacrifices from all; both the high class as well as the common man” Denouncing the Minister of Information for his gaffe that Senegal has the best jollof rice, the one time Olympic torch bearer, declared emphatically that Nigeria is number one in everything including having the best jollof rice in the world.